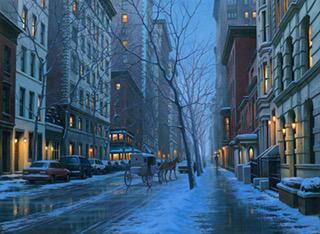 For your consideration, below you'll find new beautiful limited edition giclee on canvas releases by Alexei Butirskiy. 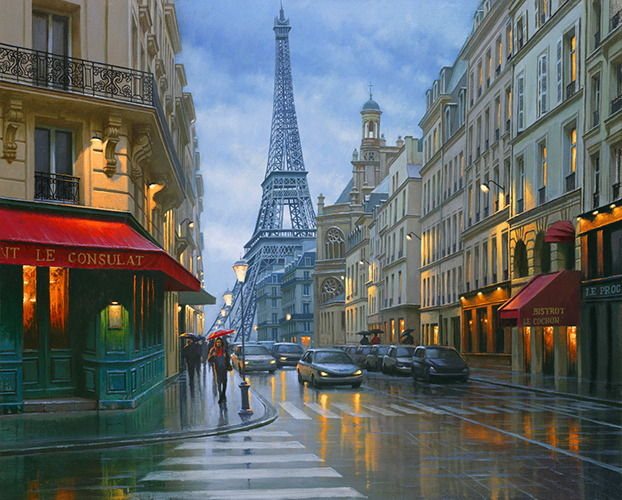 His new masterpieces feature some of the world's favorite cities including New York, Chicago, Venice, London and Paris in impressive renderings by this young master, each piece having its own appeal. 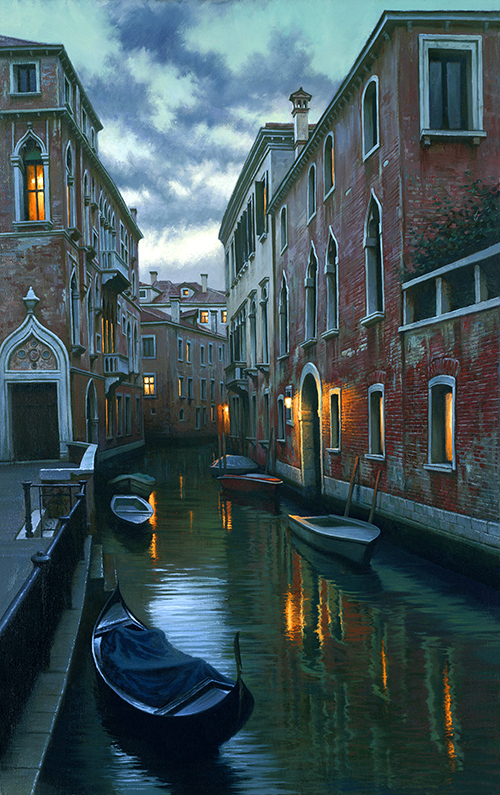 Alexei again captures the serenity of early evening in romantic Venice. Who can help but want to be there at this precise moment. 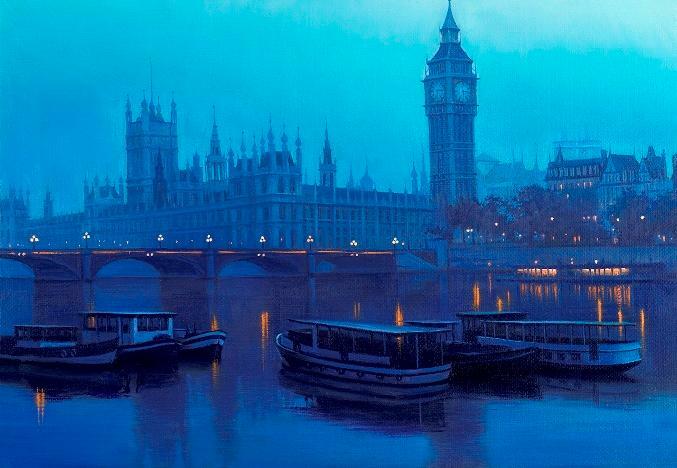 As the mist of the incoming fog begins to blur the image of this city of kings & queens, Alexei presents a romantic vision of London with a palette that is unique to this moment! In the foreground, the energy of Parisians heading home in early evening contrasts with the steadfast and ever-present calming effect of the giant among icons - the Eiffel Tower, looming in the background. What exemplifies the windy city better than the Chicago River, winding its way past endless skyscrapers on its way from Lake Michigan? 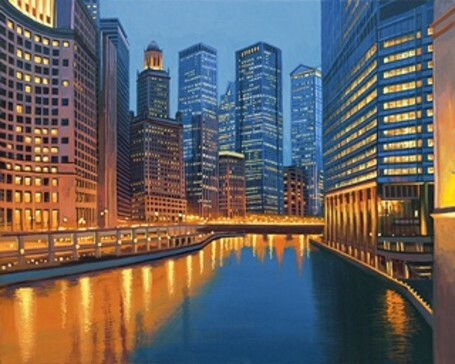 Alexei captured the city alive in its luminous grandeur, what a beauty! Alexei's latest composition of one of his favorite cities enables you to be a part of, make a brand-new start of it or dream of whatever you want with it. (Compliments to song writers, John Kander and Fred Ebb.) 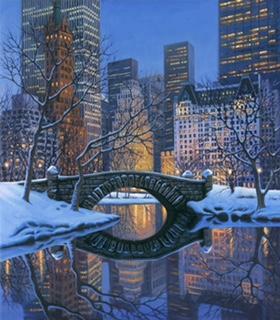 No image contains Alexei's iconic reflections and luminosity better than New York - New York! In the heart of the city that never sleeps, Alexei captures a moment of quiet, with a charming horse & carriage near Central Park. This is a great painting, so start spreading the news! What do you think of this new improved state? and reserve your artwork now. In addition to Thomas Arvid painting live in the gallery February 20- 24, 2018, Key West Gallery will host more special events. Join us for these unique opportunities to spend an evening with America's preeminent painter of wine. 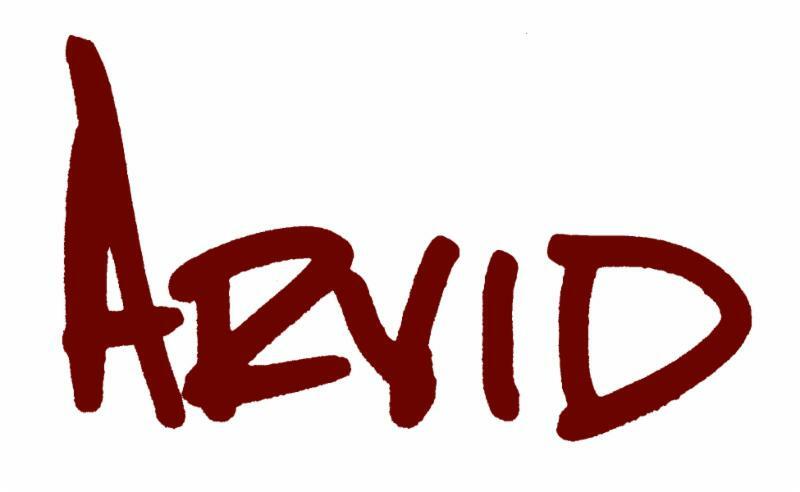 Relax, grab a glass of wine and get to know Arvid and his art a little better. Prime Steakhouse has become the premiere steakhouse in the Florida Keys. Under the supervision of the executive chef and Thomas Arvid a carefully curated menu and the finest of accompanying wine selections will be served. Space is limited and reservations will be taken on a first- come, first served basis. Each guest will receive a hand-signed personalized dedication by Thomas Arvid on archival paper along with a commemorative photograph with Thomas Arvid at the event. $130 per person plus 7.5% tax and 20% gratuity. Call 305-292-9339 for details and to reserve your seats now, space is extremely limited and reservations are required. D. Arthur Wilson’s creates artwork with his passion and self-defined style of “Wild Expressionism”. His paintings are rendered on European Suede Mat Board with specific application of pastel, Conte’ crayon and charcoal, each is a masterpiece for generations to appreciate. 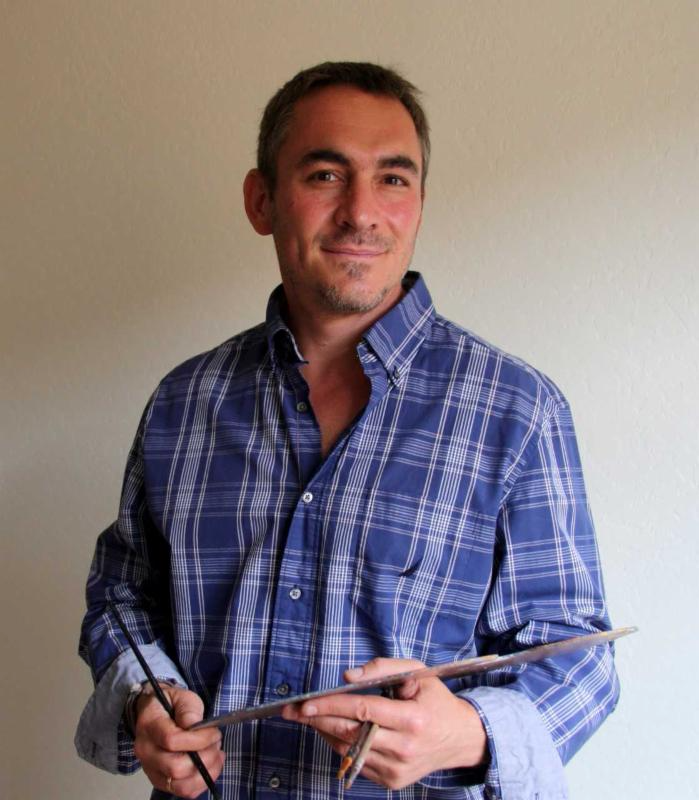 D. Arthur will paint and sculpt at Key West Gallery during the show. Lisa Wilson is an Abstract Expressionist painter. Her masterpieces are rendered in oil, acrylic, sculpting mediums and a multitude of color, on board, gold leaf or fine art acrylic. B-Roll, High Resolution 300dpi images available. Interviews with Peter Max upon request. Key West, Florida – (January 2018) – A newly-curated collection by artist legend, Peter Max’s exquisite paintings will be on exhibition and available for acquisition in a presentation at Key West’s premier gallery. The exhibition opens on February 5th, 2018 and runs through February 11th. Ms. Lesley Smith, Collection Curator, will accompany the Collection and be in gallery for Events Friday, February the 9th, Saturday the 10th and Sunday Feb 11th, 2018. This unique and newly curated Collection is a never-before seen Collection of Celebrity portraiture, the Artists’ most Iconic works from six decades, and a tribute to love and hearts for Valentine’s Day 2018. All gallery events are complimentary and open to the public. All artworks are on exhibition and available for acquisition. Max’s iconic ‘Love,’ first created as his acclaimed Art Nouveau-inspired ‘Love’ poster for the ‘60s generation, now flows with his signature, expressionistic brushstrokes. Max has been successively called a Pop Icon, Neo Fauvist, Abstract Expressionist and the United States “Painter Laureate.” The artist has had the distinct honor of painting the last seven Presidents of the United States and the world’s best-loved celebrities, among them the young sensation Taylor Swift. He has been the Official Artist of the Grammy’s, five NFL Super Bowls, the 2006 Olympics, the World Cup USA, The World Series, The U.S. Open, The Indy 500, The NYC Marathon and The Kentucky Derby. Important pieces of the Retrospective Collection and the Masters Series will be available for acquisition in the Key West presentation. Arrive in New York City where you’ll stay at Park Lane Hotel. 11 am- Complimentary Brunch Reception hosted by Key West Gallery at Park Lane Hotel. 1 to 3 pm- Visit the Peter Max Studio where you will meet Peter Max who will be more than happy to dedicate and personalize any new artwork purchases for guests of Key West Gallery. Make your reservations now, as space is limited. For additional details call 305-923-1696. Breaking with tradition, Frogman’s 2018 Valentine’s Sculpture features subject matter straight from the Tim Cotterill Aviary. Two colorful lovebirds perch atop a silver nitrate reed clearly enamored with each another. Lovebirds, often considered the inspiration for Valentine’s Day, provide the ideal expression for this annual holiday release.